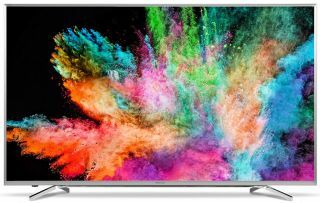 Hisense unveils its second ULED TV, the M7000, from £799 | What Hi-Fi? The M7000 is Hisense’s second ULED screen and follows the 2015 release of the XT910. It’s the company’s first flat screen ULED TV and is available in 55in and 65in variants, priced from £799. Hisense is once again going for headline grabbing features with its latest ULED screen. It supports 4K Ultra HD pictures with High Dynamic Range, local dimming and has a range of smart functionalities. As we’ve seen with previous Hisense TVs, the company is once again undercutting its rivals when it comes to price. The 55in M7000 will generally be available for £799 and is currently on offer at John Lewis for £749, while the 65in will cost £1199. ULED is Hisense’s way of developing LED technology and promises to offer all the benefits of OLED panels in a much more affordable guise. Hisense says the combination of ULED technology and its own software allows the M7000 to “produce exquisite clarity and bold colours with an organic sense of reality”. The company describes ULED as “a collective term for a suite of technologies that improves overall picture quality and resolves the key weaknesses of the [LED] platform – black levels”. Those technologies include Wide Colour Gamut, High Dynamic Contrast and 240-zone local dimming. Behind the screen you’ll find a quad-core processor powering the M7000 along with built-in wi-fi for connecting to the internet and Hisense’s smart TV platform. Streaming services including BBC iPlayer, Amazon Video and Netflix come pre-installed, with the latter two being able to stream 4K content. Anyview Cast and Anyview Stream also come as standard and these allow you to mirror content from your smartphone, tablet or computer on to the TV screen. The Hisense M7000 is available now in both 55in and 65in models from John Lewis.